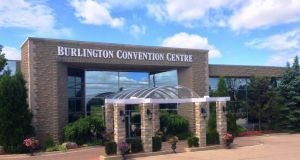 Whether you are hosting a Trade Show, Sales Meeting, Training Seminar, Product Launch, a Corporate Christmas Party or Road Show, the Award Winning Burlington Convention Centre combines experience with the newest in catering trends and hospitality standards, all delivered on time and on budget. Our Corporate Event Planners will work with you every step of the way to ensure the success of your corporate event. At the Burlington Convention Centre, our unique style of French Service and gourmet food presentations will add the finishing touch to any Corporate Event.